A mid-18th-century engraving of Palazzo Farnese by Giuseppe Vasi. Detail of the Triumph of Bacchus and Ariadne by Annibale Carracci, the Farnese Gallery, 1595. Palazzo Farnese ([paˈlattso farˈneːze; -eːse]) or Farnese Palace is one of the most important High Renaissance palaces in Rome. Owned by the Italian Republic, it was given to the French government in 1936 for a period of 99 years, and currently serves as the French embassy in Italy. 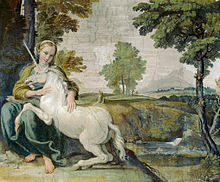 At the end of the 16th century, the important fresco cycle of The Loves of the Gods in the Farnese Gallery was carried out by the Bolognese painter Annibale Carracci, marking the beginning of two divergent trends in painting during the 17th century, the Roman High Baroque and Classicism. The famous Farnese sculpture collection, now in the National Archeological Museum of Naples, as well as other Farnese collections, now mostly in Capodimonte Museum in Naples, were accommodated in the palace. "The most imposing Italian palace of the 16th century", according to Sir Banister Fletcher, this palace was designed by Antonio da Sangallo the Younger, one of Bramante's assistants in the design of St. Peter's and an important Renaissance architect in his own right. Construction began in 1515 after one or two years of preparation, and was commissioned by Alessandro Farnese, who had been appointed as a cardinal in 1493 at age 25 and was living a princely lifestyle. Work was interrupted by the Sack of Rome in 1527. 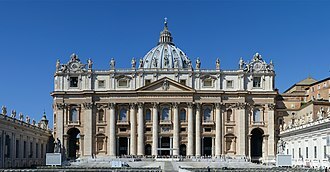 When, in January 1534 Alessandro became Pope Paul III, the size of the palace was increased significantly and he employed Michelangelo who completed the redesigned third story with its deep cornice and revised the courtyard as well. The post-1534 developments were not only a reflection of Alessandro's change in status but employed architecture to express the power of the Farnese family, much as at their Villa Farnese at Caprarola. The massive palace block and its facade dominate the Piazza Farnese. Architectural features of the main facade include the alternating triangular and segmental pediments that cap the windows of the piano nobile, the central rusticated portal and Michelangelo's projecting cornice which throws a deep shadow on the top of the facade. Michelangelo revised the central window in 1541, adding an architrave to give a central focus to the facade, above which is the largest papal stemma, or coat-of-arms with papal tiara, Rome had ever seen. When Paul appeared on the balcony, the entire facade became a setting for his person. The courtyard, initially open arcades, is ringed by an academic exercise in ascending orders (Doric, Ionic and Corinthian). The piano nobile entablature was given a frieze with garlands, added by Michelangelo. On the garden side of the palace, which faced the River Tiber, Michelangelo proposed the innovatory design of a bridge which, if completed, would have linked the palace with the gardens of the Vigna Farnese, Alessandro's holding on the opposite bank, that later became incorporated into the adjacent villa belonging to the Chigi family, which the Farnese purchased in 1584 and renamed the Villa Farnesina. While the practicalities of achieving this bridge remain dubious, the idea was a bold and expansive one. During the 16th century, two large granite basins from the Baths of Caracalla were adapted as fountains in the Piazza Farnese, the "urban" face of the palace. The palazzo was further modified for the papal nephew Ranuccio Farnese by Jacopo Barozzi da Vignola. It was completed for the second Cardinal Alessandro Farnese by Giacomo della Porta's porticoed facade towards the Tiber which was finished in 1589. Following the death of Cardinal Odoardo Farnese in 1626, the palazzo stood virtually uninhabited for twenty years. At the conclusion of the War of Castro with the papacy, Duke Odoardo was able to regain his family properties, which had been sequestered. The resulting inventory (see below) is the oldest surviving complete inventory of Palazzo Farnese. After Odoardo's death, Pope Alexander VII allowed Queen Christina of Sweden to lodge in the palace for several months, but she "proved a tenant from hell". 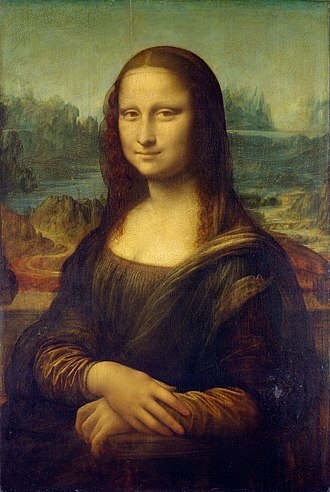 After her departure for Paris, the papal authorities discovered that her unruly servants not only had stolen the silver, tapestries, and paintings, but also had "smashed up doors for firewood" and removed sections of copper roofing. Several main rooms were frescoed with elaborate allegorical programs including the Hercules cycle in the Sala d'Ercole or the Hercules Room, the "Sala del Mappamondo" or The Room of Maps, and the well known The Loves of the Gods (1597–1608) in the Farnese Gallery, both by the Bolognese painter Annibale Carracci. Other rooms have frescoes by Daniele da Volterra and by other artists. For generations, the room with Herculean frescoes accommodated the famous Greco-Roman antique sculpture known as the Farnese Hercules. Other works from the family collection of classical sculpture were also housed in the palace. One of the vault and ceiling fresco by Annibale Carracci is Galleria Farnese, an art gallery. 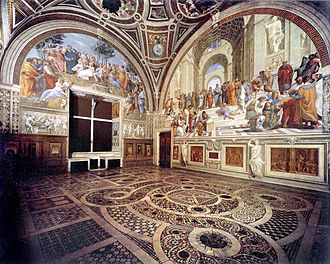 According to Ann Sutherland Harris, "The Galleria frescoes make even more extensive use of ancient sculptural and architectural sources, and in addition take their basic structure from two ceilings by the most prestigious artists of the High Renaissance in Rome, the Loggia of Psyche by Raphael and Michelangelo's Sistine Chapel ceiling". Carracci adopted the quadri riportati, which the ceiling is divided into units and turned it into a collection of framed paintings, along with the cast masks among the garlands, and carved putti, and sculptures supporting the central scene. This large central scene depicts the triumphal progress of Bacchus and Ariadne. 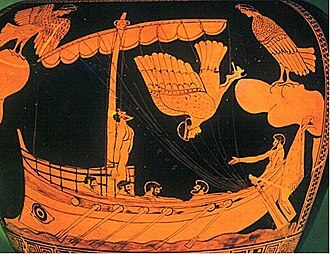 Two smaller paintings are attached to the top and bottom of the central picture, and two vertical pictures on either side, filled with sphinxes, Pan, and two satyrs. The Palazzo's design has inspired several buildings outside Italy, including the Detroit Athletic Club in Detroit, Michigan; Château Grimaldi near Aix-en-Provence, France; the National Building Museum in Washington, D.C., USA; the Chief Secretary's Building in Sydney; and the Royal Palace, Stockholm. In England Charles Barry's great admiration for the building led him to use it as the model for London's Reform Club. In Puccini's opera Tosca (1900), set in Napoleonic Rome, the heroine's confrontation with the malevolent chief of police, Scarpia, takes place in Palazzo Farnese. The Palazzo was inherited from the Farnese by the Bourbon kings of Naples, from whom the French government purchased it in 1874. Though the government of Benito Mussolini ransomed it in 1936, the French Embassy remains, under a 99-year lease for which they pay the Italian government a symbolic fee of 1 euro per month. F.C. Uginet, Le palais farnèse à travers les documents financiers (Rome 1980). A. Chastel, Le Palais Farnèse. Ecole Française de Rome I.1 and I.2 and II (Rome 1980–82). F. Fossier. Le Palais Farnèse III.2. La bibliothèque Farnèse. Étude des manuscrits latins et en langue vernaculaire (Rome 1982). The Palazzo Farnese was filmed as part of the 2013 Julian Fellowes re-creation of Shakespeare's Romeo and Juliet starring Douglas Booth as the lead. ^ D. Cruikshank, ed. Sir Banister Fletcher's A History of Architecture, 20th edition 1996:873. ^ Facade conservation works made in 2000 by Laura Cherubini see Alessandro Pergoli Campanelli, Il Restauro di Palazzo Farnese – AR, XXXV, luglio-agosto 2000, pp. 36–39. 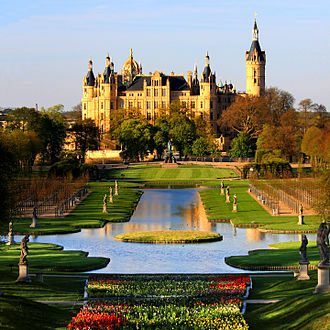 ^ "The incredibly pretentious magnificence of this residence for a single man points to the imminence of Baroque.... This monumental window seems to await the arrival of the great overlord who is about to show himself to the populace", remarked Siegfried Giedion, Space, Time and Architecture (1941) 1962, pp. 56–57. ^ Quoted from: Colvin, Clare. Eccentric Rebel Without a Crown. Independent, 24 May 2004. ^ Pavel Muratov. 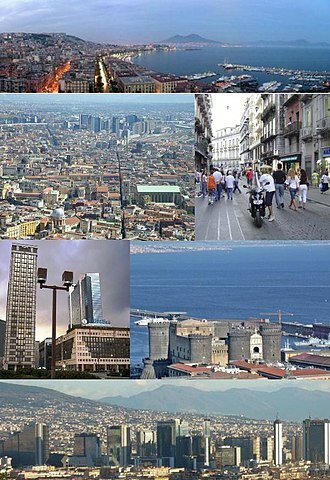 Images of Italy. Berlin, 1924. Reprinted St. Petersburg, 2005. ISBN 5-352-01476-2. Vol. 2, page 155. ^ Maynard, Brent. "Detroit Athletic Club". Detroit Historical Society. Detroit Historical Society. Retrieved 18 September 2015. Murray, Peter (1963). The Architecture of the Italian Renaissance. Schocken Books, New York. pp. 158–164. 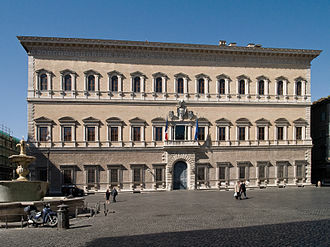 Wikimedia Commons has media related to Palazzo Farnese (Rome). Satellite photo – The Palazzo Farnese is the massive, almost square, courtyarded structure in the center of the photo, to the North of the Tiber. The smaller bracket-shaped building southwest (lower) across the Tiber is the Villa Farnesina. Pope Paul III, born Alessandro Farnese, was Pope from 13 October 1534 to his death in 1549. He came to the throne in an era following the sack of Rome in 1527. He convened the Council of Trent in 1545 and he was a significant patron of the arts and employed nepotism to advance the power and fortunes of his family. It is to Pope Paul III that Nicolaus Copernicus dedicated De revolutionibus orbium coelestium, alessandro’s humanist education was at the University of Pisa and the court of Lorenzo de Medici. Initially trained as a notary, he joined the Roman Curia in 1491. Farnese’s sister, Giulia was reputedly a mistress of Alexander VI, for this reason, he was sometimes mockingly referred to as the Borgia brother-in-law, just as Giulia was mocked as the Bride of Christ. More disparagingly he was referred to as Cardinal Fregnese, as Bishop of Parma, he came under the influence of his vicar general, Bartolomeo Guidiccioni. This led to the future pope breaking off the relationship with his mistress, under Pope Clement VII he became Cardinal Bishop of Ostia and dean of the College of Cardinals, and on the death of Clement VII in 1534, was elected as Pope Paul III. As a young cleric, Alessandro lived a dissolute life, taking for himself a mistress. By Silvia Ruffini, he fathered Pier Luigi Farnese, whom he created Duke of Parma, others included Ranuccio Farnese, the fourth pope during the period of the Protestant Reformation, Paul III became the first to take active reform measures in response to Protestantism. 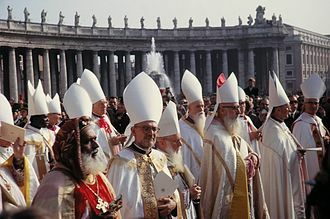 Paul III first deferred for a year and discarded the whole project, in 1536, Paul III invited nine eminent prelates, distinguished by learning and piety alike, to act in committee and to report on the reformation and rebuilding of the Church. This report was printed not only at Rome, but at Strasburg, yet the Pope was in earnest when he took up the problem of reform. Yet it is clear that the Concilium bore no fruit in the situation. On the other hand, serious political complications resulted, in order to vest his grandson Ottavio Farnese with the dukedom of Camerino, Paul forcibly wrested the same from the duke of Urbino. He incurred virtual war with his own subjects and vassals by the imposition of burdensome taxes, renouncing its obedience, was besieged by Pauls son, Pier Luigi, and forfeited its freedom entirely on its surrender. Aix-en-Provence, or simply Aix, is a city-commune in the south of France, about 30 km north of Marseille. It is in the region of Provence-Alpes-Côte dAzur, in the department of Bouches-du-Rhône, the population of Aix numbers approximately 143,000. Its inhabitants are called Aixois or, less commonly, Aix was founded in 123 BC by the Roman consul Sextius Calvinus, who gave his name to its springs, following the destruction of the nearby Gallic oppidum at Entremont. In the 4th century AD it became the metropolis of Narbonensis Secunda and it was occupied by the Visigoths in 477. 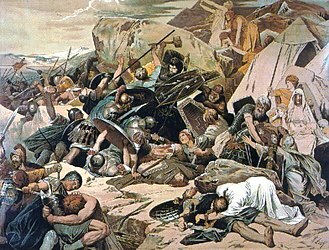 In the succeeding century, the town was plundered by the Franks and Lombards. Aix passed to the crown of France with the rest of Provence in 1487, and in 1501 Louis XII established there the parliament of Provence, in the 17th and 18th centuries, the town was the seat of the Intendance of Provence. Current archeological excavations in the Ville des Tours, a suburb of Aix, have unearthed the remains of a Roman amphitheatre. The city slopes gently north to south and the Montagne Sainte-Victoire can easily be seen to the east. Aixs position in the south of France gives it a warm climate and it has an average January temperature of 5 °C and a July average of 23 °C. It has an average of 300 days of sunshine and only 91 days of rain, while it is partially protected from the Mistral, Aix still occasionally experiences the cooler and gusty conditions it brings. Unlike most of France which has a climate, Aix-en-Provence has a Mediterranean climate. The Cours Mirabeau is a thoroughfare, planted with double rows of plane-trees, bordered by fine houses. It follows the line of the old city wall and divides the town into two sections. 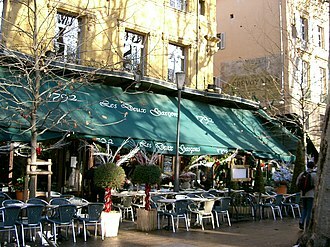 The new town extends to the south and west, the old town, with its narrow, along this avenue, which is lined on one side with banks and on the other with cafés, is the Deux Garçons, the most famous brasserie in Aix. Built in 1792, it has been frequented by the likes of Paul Cézanne, Émile Zola, the Cathedral of the Holy Saviour is situated to the north in the medieval part of Aix. The Naples National Archaeological Museum is a museum in Naples, southern Italy, at the northwest corner of the original Greek wall of the city of Neapolis. The museum contains a collection of Roman artifacts from Pompeii, Stabiae. The collection includes works of the highest quality produced in Greek, Roman and it is the most important Italian archaeological museum and is considered one of the most important in the world. Charles of Bourbon founded the museum in the 1750s, the building he used for it had been erected as a cavalry barracks and during its time as the seat of the University of Naples was extended, in the late 18th century. The museum hosts extensive collections of Greek and Roman antiquities and their core is from the Farnese Collection, which includes a collection of engraved gems and the Farnese Marbles. Among the notable works found in the museum are the Herculaneum papyri, carbonized by the eruption of Mount Vesuvius, many of these works, especially the larger ones, have been moved to the Museo di Capodimonte for display in recent years. The Farnese Hercules, which fixed the image of Hercules in the European imagination, a major collection of ancient Roman bronzes from the Villa of the Papyri is housed at the museum. 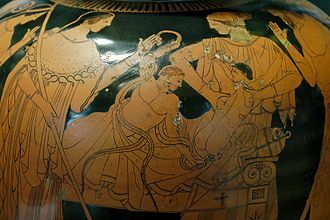 These include the Seated Hermes, a sprawling Drunken Satyr, a bust of Thespis, another variously identified as Seneca or Hesiod, the museums Mosaic Collection includes a number of important mosaics recovered from the ruins of Pompeii and the other Vesuvian cities. 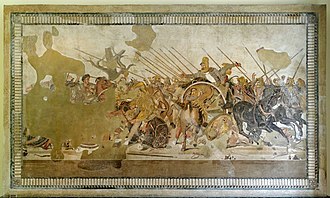 This includes the Alexander Mosaic, dating from circa 100 BC and it depicts a battle between the armies of Alexander the Great and Darius III of Persia. Another mosaic found is that of the gladiatorial fighter depicted in a found from the Villa of the Figured Capitals in Pompeii. With 2,500 objects, the museum has one of the largest collection of Egyptian artifacts in Italy after the Turin and Bologna ones. It is made up primarily of works from two collections, assembled by Cardinal Stefano Borgia in the second half of the 18th century. In its new layout the collection provides both an important record of Egyptian civilization from the Old Kingdom up to the Ptolemaic-Roman era, access was limited to only persons of mature age and known morals. In art history, High Renaissance is the period denoting the apogee of the visual arts in the Italian Renaissance. This term was first used in German in the nineteenth century. 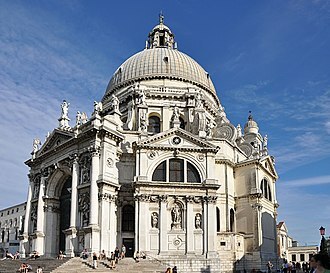 High Renaissance style in architecture conventionally begins with Donato Bramante, whose Tempietto at S. Pietro in Montorio at Rome was begun in 1510, the Tempietto, signifies a full-scale revival of ancient Roman commemorative architecture. David Watkin writes that the Tempietto, like Raphaels works in the Vatican, is an attempt at reconciling Christian, the High Renaissance was traditionally viewed as a great explosion of creative genius, following a model of art history first proposed by the Florentine Giorgio Vasari. 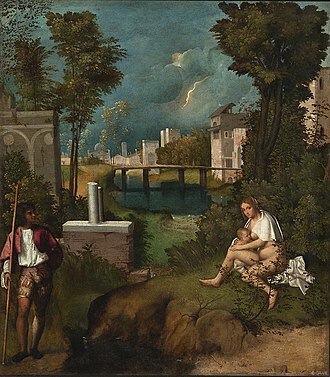 Even relatively minor painters of the period, such as Fra Bartolomeo and Mariotto Albertinelli, produced works that are still lauded for the harmony of their design, the serene mood and luminous colours of paintings by Giorgione and early Titian exemplify High Renaissance style as practiced in Venice. Classicism, in the arts, refers generally to a high regard for a classical period, classical antiquity in the Western tradition, as setting standards for taste which the classicists seek to emulate. Classicism is a genre of philosophy, expressing itself in literature, architecture and music, which has Ancient Greek and Roman sources. It was particularly expressed in the Neoclassicism of the Age of Enlightenment, Classicism is a recurrent tendency in the Late Antique period, and had a major revival in Carolingian and Ottonian art. Until that time the identification with antiquity had been seen as a history of Christendom from the conversion of Roman Emperor Constantine I. Renaissance classicism introduced a host of elements into European culture, including the application of mathematics and empiricism into art, humanism and depictive realism, importantly it introduced Polytheism, or paganism, and the juxtaposition of ancient and modern. The classicism of the Renaissance led to, and gave way to and this period sought the revival of classical art forms, including Greek drama and music. Opera, in its modern European form, had its roots in attempts to recreate the combination of singing and dancing with theatre thought to be the Greek norm, examples of this appeal to classicism included Dante and Shakespeare in poetry and theatre. Tudor drama, in particular, modeled itself after classical ideals, studying Ancient Greek became regarded as essential for a well-rounded education in the liberal arts. They began reviving plastic arts such as bronze casting for sculpture, for example, the painting of Jacques-Louis David which was seen as an attempt to return to formal balance, clarity and vigor in art. Various movements of the period saw themselves as classical revolts against a prevailing trend of emotionalism and irregularity. The 20th century saw a number of changes in the arts, both pre-20th century disciplines were labelled classical and modern movements in art which saw themselves as aligned with light, sparseness of texture, and formal coherence. Examples of classicist playwrights are Pierre Corneille, Jean Racine and Moliere, the influence of these French rules on playwrights in other nations is debatable. Annibale Carracci was an Italian painter, active in Bologna and in Rome. Painters working under Annibale at the gallery of the Palazzo Farnese would be influential in Roman painting for decades. Annibale Carracci was born in Bologna, and in all likelihood was first apprenticed within his family, in 1582, his brother Agostino and his cousin Ludovico Carracci opened a painters studio, initially called by some the Academy of the Desiderosi and subsequently the Incamminati. This eclecticism was to become the defining trait of the artists of the Baroque Emilian or Bolognese School, in many early Bolognese works by the Carraccis, it is difficult to distinguish the individual contributions made by each. For example, the frescoes on the story of Jason for Palazzo Fava in Bologna are signed Carracci, in 1585, Annibale completed an altarpiece of the Baptism of Christ for the church of Santi Gregorio e Siro in Bologna. In 1587, he painted the Assumption for the church of San Rocco in Reggio Emilia, in 1587–88, Annibale is known to have had travelled to Parma and Venice, where he joined his brother Agostino. 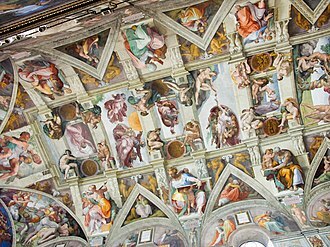 From 1589 to 1592, the three Carracci brothers completed the frescoes on the Founding of Rome for Palazzo Magnani in Bologna, by 1593, Annibale had completed an altarpiece, Virgin on the throne with St John and St Catherine, in collaboration with Lucio Massari. His Resurrection of Christ dates from 1593, in 1592, he painted an Assumption for the Bonasoni chapel in San Francesco. During 1593-94, all three Carraccis were working on frescoes in Palazzo Sampieri in Bologna and his work would inspire the untrammelled stream of Baroque illusionism and energy that would emerge in the grand frescoes of Cortona, and in decades Andrea Pozzo and Gaulli. Throughout the 17th and 18th centuries, the Farnese Ceiling was considered the masterpiece of fresco painting for its age. On the other hand, while admitting Caravaggios talents as a painter, Bellori deplored his over-naturalistic style, if not his turbulent morals and he thus viewed the Caravaggisti styles with the same gloomy dismay. Painters were urged to depict the Platonic ideal of beauty, not Roman street-walkers, yet Carracci and Caravaggio patrons and pupils did not all fall into irreconcilable camps. Contemporary patrons, such as Marquess Vincenzo Giustiniani, found both applied showed excellence in maniera and modeling, in our century, observers have warmed to the rebel myth of Caravaggio, and often ignore the profound influence on art that Carracci had. Caravaggio almost never worked in fresco, regarded as the test of a great painters mettle, on the other hand, Carraccis best works are in fresco. Thus the somber canvases of Caravaggio, with benighted backgrounds, are suited to the contemplative altars, wittkower was surprised that a Farnese cardinal surrounded himself with frescoes of libidinous themes, indicative of a considerable relaxation of counter-reformatory morality. This thematic choice suggests Carracci may have been more rebellious relative to the often-solemn religious passion of Caravaggios canvases, wittkower states Carraccis frescoes convey the impression of a tremendous joie de vivre, a new blossoming of vitality and of an energy long repressed. It is instructive to compare Carraccis Assumption with Caravaggios Death of the Virgin, among early contemporaries, Carracci would have been an innovator. For the town in Italy with the same name, see Farnese, Lazio. The Farnese family is a family in Renaissance Italy. The titles of Duke of Parma and Piacenza and Duke of Castro were held by members of the family. A number of important architectural works and antiquities are associated with the Farnese family, buildings include the Palazzo Farnese in Rome and the Villa Farnese at Caprarola, and ancient artifacts include the Farnese Marbles. The family could trace its origins back to around AD984, there has been some debate as to the origins of the name Farnesi/Farnese. In the 12th century, they are recorded as minor feudataries in the areas of Tuscania and Orvieto, one Pietro defeated the Tuscan Ghibellines in 1110 and, most likely, fought against the Italo-Normans in 1134. His son Prudenzio was consul in Orvieto and defeated the Orvieto Ghibellines backed by Siena, in 1254, one Ranuccio defeated Todis troops and fought for Pope Urban IV against Manfred of Sicily. His son Niccolò was in the Guelph army in the Battle of Benevento, the Farnese returned to Tuscia in 1319, when they acquired Farnese, Ischia di Castro, and the castles of Sala and San Savino. 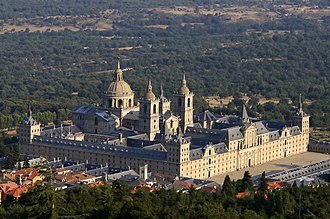 In 1354, Cardinal Albornoz, in return for the help in the war against the Papal riotous barons. In this period they fought against the fierce Papal rivals, the Prefetti di Vico, in 1362, Pietro Farnese was commander-in-chief of the Florentine army against Pisa in the war for Volterra. Six years Niccolò Farnese saved Pope Urban V from the attack of Giovanni di Vico, first in the castle of Viterbo and in that of Montefiascone. The family substantially increased its power in the course of the 15th century, as their territories reached the shore of the Lake Bolsena and Montalto. He was commander-in-chief of the forces of neighbouring Siena against the Orsini of Pitigliano and, after his victory and his son, Gabriele Francesco, took up a military career, a line of employment which disappeared after three generations. Ranuccios son, Pier Luigi, married a member of the ancient baronial family of the Caetani, thus giving the Farnese further importance in Rome. His daughter, who was a mistress of Pope Alexander VI, under Alexanders successor, Pope Julius II, he became governor of the Marca Anconetana and, in 1534, he was elected as pope and took the name of Paul III. The Sack of Rome on 6 May 1527 was a military event carried out by the mutinous troops of Charles V, Holy Roman Emperor, in Rome, part of the Papal States. It marked a crucial victory in the conflict between Charles and the League of Cognac —the alliance of France, Venice, Florence. The army of the Holy Roman Emperor defeated the French army in Italy, the 34,000 Imperial troops mutinied and forced their commander, Charles III, Duke of Bourbon and Constable of France, to lead them towards Rome. Numerous bandits, along with the Leagues deserters, joined the army during its march, the Duke left Arezzo on 20 April 1527, taking advantage of the chaos among the Venetians and their allies after a revolt which had broken out in Florence against the Medici. In this way, the undisciplined troops sacked Acquapendente and San Lorenzo alle Grotte. The troops defending Rome were not at all numerous, consisting of 5,000 militiamen led by Renzo da Ceri and 189 Papal Swiss Guard, the citys fortifications included the massive walls, and it possessed a good artillery force, which the Imperial army lacked. Duke Charles needed to conquer the city swiftly, to avoid the risk of being trapped between the city and the Leagues army. On 6 May, the Imperial army attacked the walls at the Gianicolo, Duke Charles was fatally wounded in the assault, allegedly shot by Benvenuto Cellini. The Duke was wearing his famous white cloak to him out to his troops. The death of the last respected command authority among the Imperial army caused any restraint in the soldiers to disappear, Philibert of Châlon took command of the armies, but he was not as popular or feared, leaving him with little authority. One of the Swiss Guards most notable hours occurred at this time, almost the entire guard was massacred by Imperial troops on the steps of St Peters Basilica. After the brutal execution of some 1,000 defenders of the Papal capital and shrines and monasteries, as well as the palaces of prelates and cardinals, were looted and destroyed. 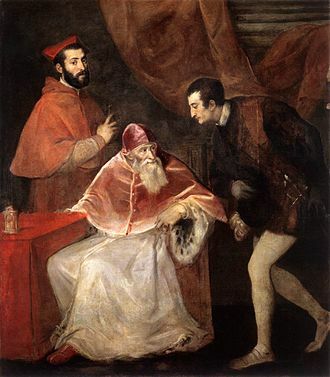 Even pro-Imperial cardinals had to pay to save their properties from the rampaging soldiers, on 8 May, Cardinal Pompeo Colonna, a personal enemy of Clement VII, entered the city. It drains a basin estimated at 17,375 square kilometres. The river has achieved lasting fame as the watercourse of the city of Rome. The river rises at Mount Fumaiolo in central Italy and flows in a southerly direction past Perugia. However, it does not form a delta, owing to a strong north-flowing sea current close to the shore, to the steep shelving of the coast. The source of the Tiber consists of two springs 10 metres away from each other on Mount Fumaiolo and these springs are called Le Vene. The springs are in a beech forest 1,268 metres above sea level, during the 1930s, Benito Mussolini placed an antique marble Roman column at the point where the river arises, inscribed QUI NASCE IL FIUME SACRO AI DESTINI DI ROMA. There is an eagle on the top of this column, the first miles of the Tiber run through Valtiberina before entering Umbria. 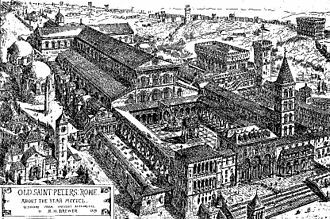 It is probable that the genesis of the name Tiber was pre-Latin, like the Roman name of Tibur, the same root is found in the Latin praenomen Tiberius. There are Etruscan variants of this praenomen in Thefarie and Teperie, the legendary king Tiberinus, ninth in the king-list of Alba Longa, was said to have drowned in the river Albula, which was afterward called Tiberis. Yet another etymology is from *dubri-, considered by Alessio as Sicel and this root *dubri- is widespread in Western Europe e. g. Dover, Portus Dubris. 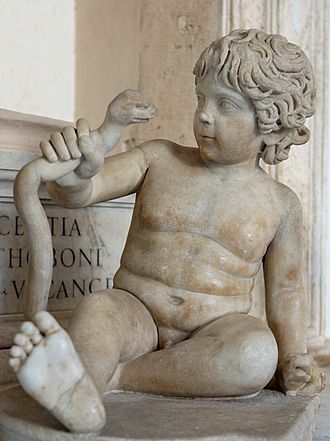 According to the legend, Jupiter made him a god and guardian spirit of the river and this gave rise to the standard Roman depiction of the river as a powerfully built reclining god, named Tiberinus, with streams of water flowing from his hair and beard. 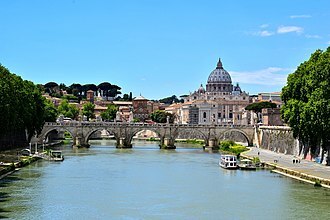 The Tiber was believed to be the river into which Romulus and Remus were thrown as infants, according to legend, the city of Rome was founded in 753 BC on the banks of the Tiber about 25 kilometres from the sea at Ostia. The island Isola Tiberina in the centre of Rome, between Trastevere and the ancient center, was the site of an important ancient ford and was bridged. Legend says Romes founders, the twin brothers Romulus and Remus, were abandoned on its waters, the river marked the boundary between the lands of the Etruscans to the west, the Sabines to the east and the Latins to the south. Benito Mussolini, born in Romagna, adjusted the boundary between Tuscany and Emilia-Romagna, so that the springs of the Tiber would lie in Romagna and it was used to ship stone and foodstuffs to Rome. Like much Ancient Roman sculpture it is a copy or version of a much older Greek original that was well-known, in this case an original by Lysippos that would have been made in the fourth century BC. The enlarged copy was made for the Baths of Caracalla in Rome, where the statue was recovered in 1546, the heroically-scaled Hercules is one of the most famous sculptures of antiquity, and has fixed the image of the mythic hero in the European imagination. The Farnese Hercules is a marble statue, following a lost original cast in bronze through a method called lost wax casting. 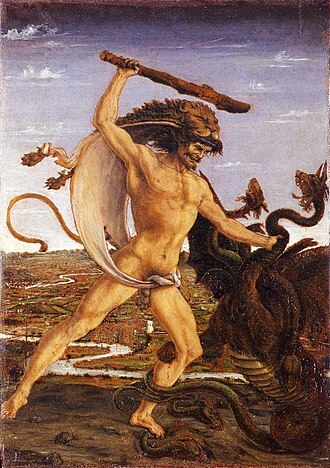 It depicts a muscular, yet weary, Hercules leaning on his club, in myths about Heracles, killing the lion was his first task. He has just performed one of the last of The Twelve Labours, the type was well known in antiquity, and among many other versions a Hellenistic or Roman bronze reduction, found at Foligno is in the Musée du Louvre. A small Roman marble copy can be seen in the Museum of the Ancient Agora, the rediscovered statue quickly made its way into the collection of Cardinal Alessandro Farnese, grandson of Pope Paul III. Alessandro Farnese was well placed to one of the greatest collections of classical sculpture that has been assembled since Antiquity. The Farnese statue was moved to Naples in 1787 with most of the Farnese Collection and is now displayed in the Museo Archeologico Nazionale there, the sculpture has been reassembled and restored by degrees. The original legs, from the Borghese collection, were not reunited with the sculpture until 1787, goethe, in his Italian Journey, recounts his differing impressions upon seeing the Hercules with each set of legs, marvelling at the clear superiority of the original ones. Hercules is caught in a moment of repose. Leaning on his club which is draped with the pelt of the Nemean Lion, he holds the apples of the Hesperides. Many engravings and woodcuts spread the fame of the Farneses Hercules, in 1590–91, during his trip to Rome, Hendrik Goltzius sketched the statue in the palazzo courtyard. Later Goltzius recorded the less-common rear view, in a bravura engraving, the young Rubens made quick sketches of the planes and massing of the statue of Hercules. Fresco cycle found on the vault of the Farnese Gallery. Cupid and Anteros wrestling framed by Atlantes and Ignudi. Venus and Anchises, showing fictive (painted) sculptural elements surrounding the scene. Ranuccio Farnese was made cardinal by Paul III at the age of 15. The five orders, engraving from Vignola's Regola delle cinque ordini d'architettura. Fountain of the Four Rivers, Bernini, 1651. Classicist door in Olomouc, The Czech Republic. 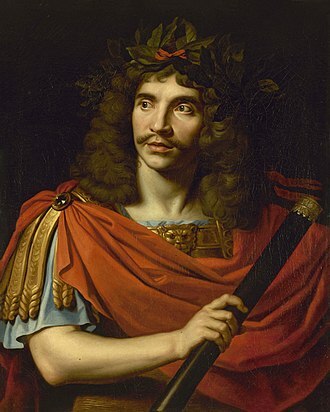 Molière in classical dress, by Nicolas Mignard, 1658. Portrait by Sébastien Bourdon, who exaggerated her eyes. Tre Kronor in Stockholm by Govert Dircksz Camphuysen. Most of Sweden's national library and royal archives were destroyed when the castle burned in 1697. Daniele da Volterra, The Prophet Elias (circa 1550-1560); in the Uffizi Gallery, Florence. The façade of the Palazzo di Pirro (nowadays part of the Palazzo Massimo alle Colonne) was decorated by Daniele with biblical scenes. Daniele da Volterra, portrait of Michelangelo; Teylers Museum, Haarlem. Prospetto principale di Palazzo di Caprarola by Giuseppe Vasi, c.1746-1748. The Farnese's Palazzo della Pilotta in Parma. Façade of the church of Gesù in Rome. 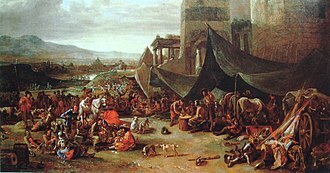 The sack of Rome in 1527, by Johannes Lingelbach, 17th century (private collection). Piazza Farnese. On the right, the Gallo Palace. Detail of frescoes in the "Perspectives' Hall" by Baldassare Peruzzi.